Me having a very discrete breakfast. No, we are NOT camping…. Our first destination in Croatia was Osijek, the fourth largest city in Croatia. Osijek is all the way on the eastern point of the country and totally off the beaten tourist track. As soon as we arrived we found a big parking lot in the city center. It was not the most charming place, but we asked around and were advised by locals that it would be no problem to sleep there. (they also gave us free beers) We found a spot with a security camera pointed to it and that was it. We decided to spend the night on the parking lot. Whenever we spend the night in a city, we are very discrete. We don’t pop up the roof nor put chairs outside. We also try to use as little light inside the van as possible. This way the van looks like a normal parked car, so no one can accuse us of wild camping. After the first night we decided that we wanted to stay in Osijek for a few more days and we found even better sleeping spots, in the historical center, at the beach and in a hidden park. We stayed on all these spots without any problem. All spots are listed on our Sleepin4wheel map. As Boef is from the wetlands of Brazil, we had to see Kopački rit, one of the largest wetlands in Europe. We took Box for a short ride form Osijek and arrived at the natural park. Not much later we found the perfect camping spot: in front of a stunning lake, with picknick tables and bathrooms available. However during the day it was full of tourists and park staff. We decided to come back there at night so we would have the place for ourselves. We came back when the sun went down. We did not know how fast to get Box down to the lake, take off our clothes and take a dive! This was just perfect! We had bought groceries to cook dinner, a bottle of wine, and this would be our first real wild camping experience in nature. But just as I came out of the water and wrapped myself in a towel, a light showed up in the darkness. And it came closer….I rushed into Box to hide. it did not help…it was the park ranger who told us to leave. Good bye wild camping experience…We ended up spending the night just 50 meters away from the lake, along the road. Which was okay, but just not….you know….the way we imagined it. A few weeks later we headed to the Croatian coast, to Opatija to be exact. The Croatian coast is amazingly beautiful, but also very touristy. This automatically means the regulations for wild camping are stricter. We expected it to be very difficult to wild camp here, so we spent the first night on a camp site. Just to get a feel for the area and to explore the possibilities. Soon we discovered that a lot of parking spaces had signs with campers with a red line through them….that’s clear, no wild camping. In the following days we found a few more hidden wild camping spots along the Croatian coast. Every time we felt comfortable enough to pop the roof up and cook dinner in the van, all without any problems or complaints from locals or the police. Just look our best spots up on our map with places to sleep in a van! But hey, we would not be Livin4wheel if we would not try. And of course, after a very pleasant and stunning drive to the first town on the island, we found a little windy road in a residential area with many vacant parking spaces under the pine trees. The road was on a 1 minute walk from the ocean, with free showers and water taps. Can it get any better? No it can’t…we decided to put Box there, pop the roof up and see what happens. Well, the only thing that happened was that we had a great night of sleep and woke up with the best view ever. Great succes! So what is the conclusion on wild camping in Croatia? Even though the laws suggest otherwise, wild camping in Croatia is perfectly possible. Of course you have to know when to be discrete. When you are in a city, don’t act like you are camping. (This goes for any city in any country) Are you in more rural areas, then you can spread out a little more. However, always be careful because you are officially acting illegal. 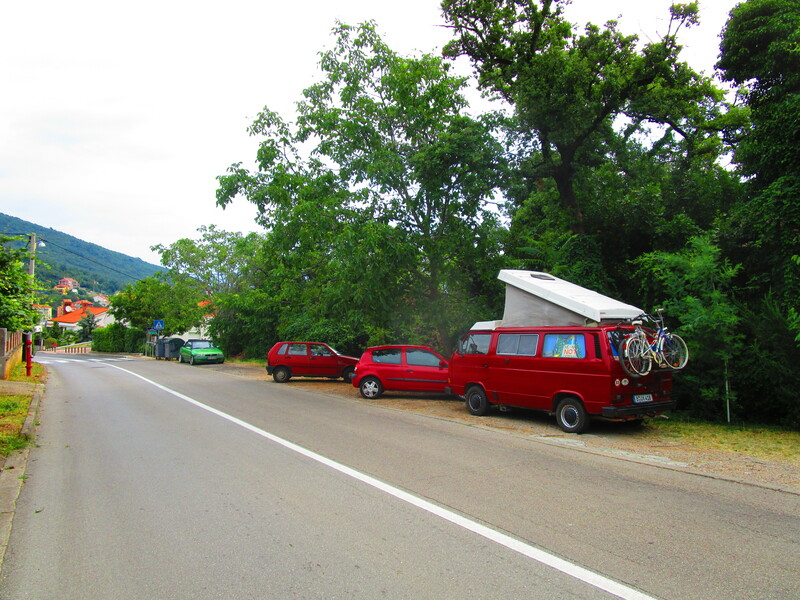 We met one other T3 owner on our trip who got busted by the police while wild camping in Croatia. Eventually the only thing that happened is that the police escorted him to the closest camp site. And even when we got sent away by the park ranger in Kopački rit, he still allowed us to camp a few meters further down the road. So even when you get busted, you are not really in trouble. (Please note that we are not legal advisors, so if you do get a fine it’s your own fault ;)) So, just be smart about picking your spots and you should be fine. And if you want to find the spots we wrote about in this post, we listed everything on our Sleepin4wheel map! Tagged camping, Croatia, nature, roadtrip. Please, feel welcome to visit our wild camp in Craotian mountain, but still just 20 minutes from beach and small town Senj. It looks amazing! Thanks for the tip. I hope we’ll come back to Croatia so we can visit. Hello, we are planning to visit Croatia, could you please specify where your camp is? We’re really excited to find some hidden camp sites! Do you think it would be possible to do some wild camping in a tent in that area? Hey Weil, we are not experts on tent camping. I guess it’s a whole different ball game. With a van you can pretend that the car is just parked with no one inside. With a tent however, it’s obvious that there are people camping. The laws on wild camping in Croatia are pretty strict, and the police does give fines for it. So you have to be very careful. Hi! Amazing information, and inspiring. We are thinking of doing something similar. But your map is not working The page is empty below the introductory paragraph..
Hey, great to hear that you find the information useful. And thanks for the tip about the map. We will look into that! Can you tell me which device/browser you are using? Why do you need a tent in these hot sunny days ? I myself hithiked through the croatian coast. At the sundown I was always able to find hidden spot to strech my tired bones. Lifetime experience, Croatia is wonderfull country. Hi Niels, I’m really happy that you find the info useful. Enjoy your trip!